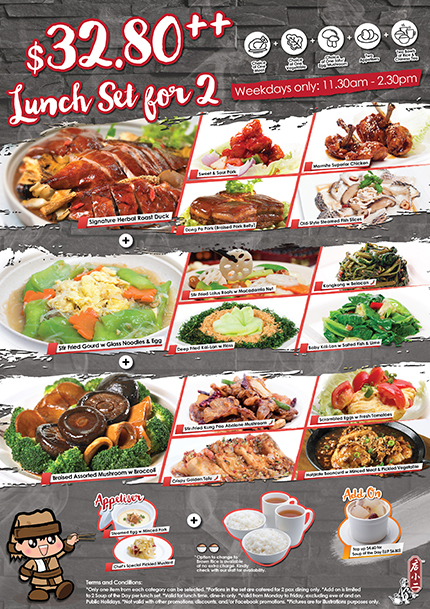 Super deal set lunch for 2 pax at $32.80++ available at specified outlets! * T&Cs apply. Only one item from each category can be selected. Add on is limited to 2 Soups of the Day per lunch set. Available for lunch time dine-in at all outlets, except Changi Airport & VivoCity. Portions in the set are catered for 2 pax dining only. Valid for lunchtime from Monday to Friday. Not valid on special occasions, eve of and on Public Holidays (E.g. Deepavali, Christmas Day, CNY Period). Not valid with other promotions, discounts, and/or Facebook promotions. To promote the “Dian Xiao Er” Herbal Roasted Duck as a globally appreciated delicacy in all major cities through an enriching dining experience in an ancient Chinese Inn. Terms & Conditions © 2017 Dian Xiao Er. All rights reserved.